After introducing the world’s longest running alkaline battery, naturally, Panasonic needs to make a product that would make use of that battery, enter the Panasonic DMC-LS80, its newest Lumix digital camera. 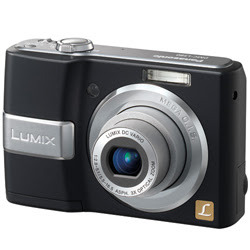 The Panasonic DMC-LS80 is powered by two AA batteries and is designed mainly for entry-level use. The Panasonic DMC-LS80 is mainly a compact digital camera with an 8.1 mega pixel resolution, 2.5 inch display, and a 3x optical zoom that features Panasonic’s newly developed LUMIX DC VARIO lens system. Though the Panasonic DMC-LS80 is an entry level camera, Panasonic has packed it with features that would make any beginners look like professional photographers. The Panasonic DMC-LS80 has a Mega optical image stabilizer that compensates for any handshake during actual picture taking, an Intelligent ISO that would change and adjust shutter speed if it detects that the subject is moving. The Panasonic DMC-LS80 also has auto macro that would automatically change the settings to macro mode when the subject is in close proximity. The Panasonic DMC-LS80 will be available starting February 2008 in pink, black, and silver colors and has a retail price of $149.95.